Hindi movie audiences have in recent years been treated to many an edgy cinematic tale set in India’s National Capital Region, warts and all. But Pairon Talle (English title: Soul of Sand) is miles away, both textually and stylistically, from any other Delhi film one might have seen before. Debutant director Sidharth Srinivasan presents a landscape that is unrelentingly grim, stark and drenched in blood. Rarely have the unseemly facets of life in a rapidly expanding Delhi been captured on the big screen quite as unflinchingly. Pairon Talle shocks and provokes and calls attention to all that is going wrong as material progress and modernization wage a losing battle with ominously regressive thought processes. The film paints a dystopian portrait of a lawless fringe of a gleaming urban expanse that is going to seed post haste as land sharks and feudal mindsets run riot and violate all norms of humanity with complete impunity. It plays out in a space that is, on the face of it, placid, even idyllic. The mine overlooks a misleadingly tranquil water body. Srinivasan adopts a style that yokes the conventions of cinematic naturalism to clearly identifiable elements of a genre film. The plot is built around a slew of disturbing systemic and social issues that Delhi and its denizens confront today on a daily basis. Among other things, Pairon Talle addresses the simmering tensions unleashed by land deals, honour killings sanctioned by guardians of medieval morality and blatant anarchy engendered by lax and corrupt policing. These are all harsh and undeniable facts of life in Delhi NCR, but Srinivasan couches his concerns in a deceptively simple linear narrative. Much of the film’s action takes place in and around an abandoned silica mine on the crime-prone outskirts of Delhi. A watchman, Bhanu Kumar (Dibyendu Bhattacharya), keeps vigil over the decrepit compound. It is difficult to divine what he is really protecting for there is nothing left here. The gate to the mine is as rickety as Bhanu’s spirits, and the rusty padlock inspires anything but confidence. Bhanu lives on the barren premises with his pretty wife, Saroj (Saba Joshi). His commitment is to his master, Lakshmichand Ahlawat (Avtar Sahni), is unquestioning and total. He is servility personified – a figure not too different from the slavish migrant worker in Adoor Gopalakrishnan’s 1993 film, Vidheyan. Bhanu has been robbed of his sense of dignity and well-being by years of enslavement and he does his master’s bidding without a pause. The only man who seems to treat Bhanu as an equal is a pliable policeman, Chattar Bitta (Rupinder Walia), whose palms have to be regularly greased in order to keep the mine out of harm’s way. But when trouble does strike, the cop proves to be as emasculated as Bhanu. The lecherous Lakshmichand, who has inherited the silica mine from his father, thinks nothing of taking advantage of Bhanu’s loyalty and sexually exploiting his young wife. On his part, Lakshmichand pledges his daughter, Twinkle (Geeta Bisht) to a man old enough to be her grandfather in a bid to induce the latter to buy the defunct mine. In this world where anything goes, real estate is valued much more than family ties and women are treated as chattel to be battered and bartered for personal and pecuniary gains. On the prowl here is a masked killer on a motorcycle. The nameless man is in pursuit of a pair of young runaway lovers. The hired assassin’s path crosses Bhanu’s, making life even more fraught with physical danger for the watchman. The only time the marauder reveals his visage, it stays off camera. Obviously, his face is as disfigured as the treacherous world that he has emerged from. When Bhanu, somewhat like the silent tribal victim in Govind Nihalani’s Aakrosh, eventually gathers the courage to break free from his shackles and give vent to his anger, it is too late for any sort of redemption. The consequences of his act are shockingly bloody. Pairon Talle goes for the jugular. It isn’t a joyride of a film. But the palpable air of menace that hangs over the setting and the sheer power of its cautionary statement make it a consistently riveting experience. Historically relevant, A Royal Affair shows its true period-drama nature in the very intelligent and detailed storyline, steadfast and conspicuous acting, and, most of all, sumptuous and glorious interiors, which actually enhance the visual experience significantly. The film expressively reminds the world once again about the illicit affair between Caroline Mathilde (Alicia Vikander), the beautiful Queen of Denmark, and the enlightened, German-born physician named Johann Struensee (Mads Mikkelsen). In all its courtly essence, A Royal Affair presents this 18th century tale with utmost thoroughness, adding huge amounts of tension to its naturalistic substance with every following minute. While it's mostly recognized for the meaningful romantic overtone, this film presents much more than that, even though the star-crossed lovers prove to have the biggest impact on the unexpected turn of events. It starts very similarly to Sofia Coppola's Marie Antoinette, with a young princess bound to marry a king she doesn't even know, through the old-fashioned way of a royal transaction. Right after the Queen finally sets her lovely eyes on the mysterious husband-to-be one thing is certain – there is something wrong with his majestic appearance. Christian VII (Mikkel Boe Følsgaard) giggles nervously, and is more interested in greeting his own dog than the woman, with whom he will probably (but not likely) spend the rest of his palace life. Right after the both absolutely awkward and truly humorous announcement of King's nightly visit in his wife's bedroom, and Caroline's anxiously awaited pregnancy, it becomes perfectly clear that the pair won't present itself in the expected, regal way. Those two characters don't even intend to give the appearance of being fully in love with each other. The king wanders angrily around the luxurious chambers making fun of everyone, not knowing that he ostentatiously presents all of his biggest weaknesses. At the same time, the Queen spends most of her time with the newborn baby. When Christian proclaims his forthcoming trip around Europe nobody realizes that big and sudden changes are about to happen. During the journey King's mental illness becomes worse. He needs a private doctor and he needs him quick. This is the moment when Johan Struensee first shows his handsome face. Apart from his unquestionable medical abilities, he proves to be a great admirer of the Enlightenment movement's greatest thinkers and their innovative works, and that's what makes him an ideal partner for the King. After returning to the country, their companionship grows stronger every day. Unfortunately, so does Johan's affection towards Queen's awe-inspiring persona. After a while, it becomes awfully obvious that they won't be able to suppress their deepest urges and a risky romance will soon take place, one that might actually begin a new era in the history of Denmark. Scheming behind the back of the wig-wearing, ignorant council, Caroline and Struensee use the gullible King for the sake of a greater good – they create many new and reformative laws, and using Christian's powerful, yet unstable hand they end up improving the whole land and its citizens' life, rushing Denmark towards the desired Enlightenment. As history so often shows, when there is the optimistic, hard-working side there must also be the pessimistic, mischievous one. In A Royal Affair, it takes the form of an ominous, recalcitrant aristocrat named Ove Høegh-Guldberg (David Dencik). Conspiring along with Christian's stepmother Juliane Marie (Trine Dyrholm) he comes up with a perfect plan to get rid of the unwanted German and, at the same time, bring back Denmark's old 'glory'. Revealing the shocking truth about Queen being pregnant with Struensee he wreaks havoc among the society. The return of the Dark Ages is upon Denmark, and no one is able to stop this devastating process, as the King gave in to Ove's strong and convincing character, and, ultimately, to his own illness. Johann and Caroline are banished from the Kingdom, just to see that, sadly, their thorough plan wasn't actually meant to help anyone. With its splendidly high entertainment value, A Royal Affair turns out to be a history lesson for everyone. Considerable attention to details in plot and in art design brings out the true substance of the film. The costumes are pitch-perfect, the music flows adequately to the events, and the ongoing transition in the atmosphere intensifies the reception of the whole. 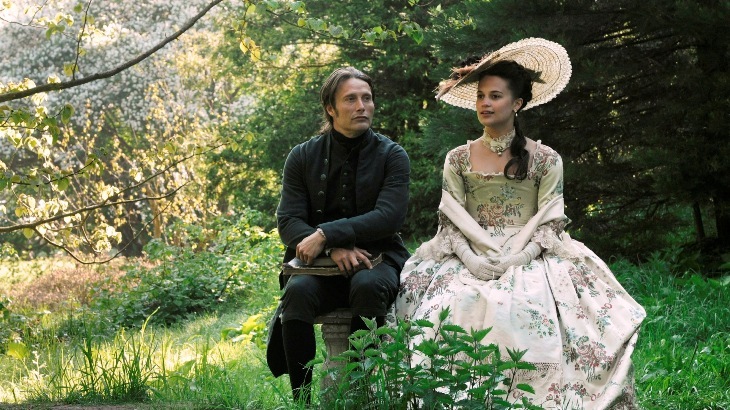 A Royal Affair possesses a great energy, which shows its true strength in all the performances. Without offending anyone from the amazing cast, it's important to note that Mads Mikkelsen gave the most award-worthy performance, showing the straightforwardly persuasive impassiveness that may really convince his fans and anti-fans alike. Therefore, those irrefutable acting skills, combined with a well-written script and steady direction, make A Royal Affair one of the most memorable Danish movies of the last decade.